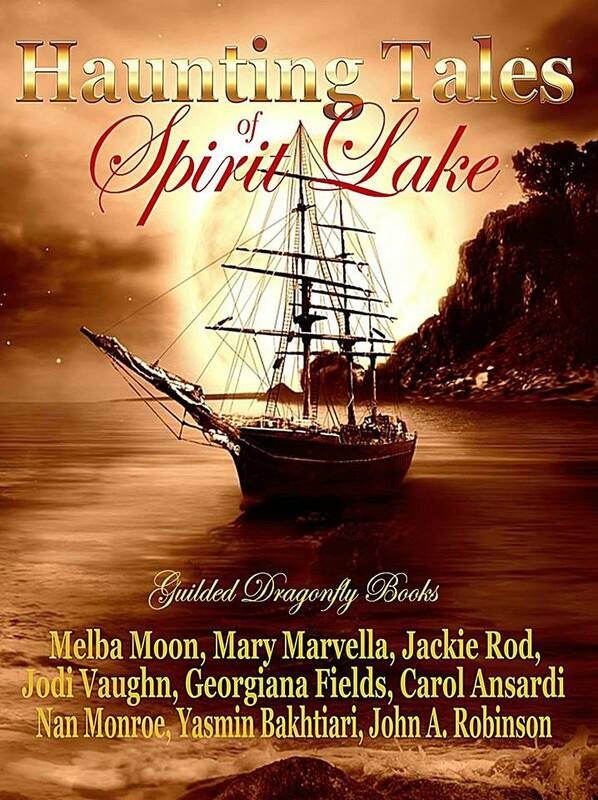 Here, for your enjoyment, is the gorgeous updated cover for Gilded Dragonfly’s anthology, Haunting Tales of Spirit Lake. My reading life has been divided into three parts: my life as a student, my life as a teacher, and my life as a writer. One thing unites them all: my desire to experience life and the world beyond what my physical existence can show me. I seek out stories that are removed from me, by time or place or both. I look to books to give me a taste of worlds beyond my window, beyond the evening news. My reading life as a student has been made up largely of nineteenth-century British fiction. When I was in the eighth grade, I read Jane Eyre and loved it. Then, toward the end of high school, I developed a taste for Charles Dickens. Not only did these books offer me a look at a place and century different from my own, but they were writing about the world outside their windows. What was time travel for me was contemporary for them, and this gave their works an authenticity of voice and detail that I couldn’t quite manage to find in twentieth-century historical fiction (though I my share of that too, Taylor Caldwell and Anya Seton being favorites of my high-school self). So I majored in English in college, and focused on nineteenth century British fiction for my doctoral work. I broadened my circle of friends to include Jane Austen (Pride and Prejudice, Persuasion), George Eliot (The Mill on the Floss, Middlemarch), Wilkie Collins (The Woman in White, The Moonstone), and Anthony Trollope (Barchester Towers, The Small House at Allington). School reading was pleasure reading, and I learned some very useful things about world-building during these days. As a teacher, I have favorite texts to which I keep returning, and interestingly enough, none of them are nineteenth-century British novels. My Composition II students may get Shakespeare’s Othello or a selection of Edgar Allan Poe stories, as both offer compelling portraits of abnormal psychology that my students find fascinating. They definitely get Kurt Vonnegut’s “Harrison Bergeron,” as frightening a dystopian vision as anything that has emerged since, an intriguing look at the struggle between the individual and the collective. (I admire the story greatly in spite of its touch of anti-feminism, the villain being named for the archer goddess Diana.) Flannery O’Connor’s “A Good Man is Hard to Find,” which I hated reading as a freshman in college, becomes an opportunity to discuss issues of faith and self-abnegation as well as more abnormal psychology. I’m not sure I would read any of these works for pure pleasure, as brilliantly written as they are (although for pure pleasure I might take in a first-rate production of Othello), but I relish the ideas they bring out, and the chance to discuss them. Then there is my reading life as a writer. Here is where my fantasy and science fiction live. I read the kinds of books I want to write, which means lots of fantasy; I haven’t yet tried my hand at writing sci-fi, but one day I might, so I’d better start reading it now — yet I confess that fantasy will always be my first love. I can’t remember a time when I didn’t relish it. My parents read fairy tales aloud to my sister and me when we were children; now I plunder fairy tale collections in search of lesser-known stories from which I can build a novel or an ARTC script or both (e.g. a Joseph Jacobs story called “Nix Nought Nothing” stretched itself in my imagination into “Nothing-at-All” and later Atterwald). I read plenty of animal fantasy as well, since like all little girls, I loved animals, and I liked the idea that they might be thinking beings with their own cultures. I read Kipling’s Jungle Books avidly, and got my father to read them aloud to me as well because I liked hearing him speak the characters’ names. Adams’ Watership Down was the first modern fantasy work I fell in love with. I was eleven, and inspired by Hazel, Fiver, Bigwig & co., I turned out a painfully amateurish but nonetheless valiant effort at an animal fantasy called “Budgie Town.” I’m quite glad it will never be made public, but I can still smile at the memory. Toward the end of my undergrad days, I took up The Hobbit, and The Lord of the Rings naturally followed. After that I searched actively for more epic/historical fantasy to read, preferably featuring a few more important female characters than could be found in Tolkien. Tad Williams’ Memory, Sorrow, and Thorn may well have been the turning point for me. Since then I’ve gathered favorite authors, among them Guy Gavriel Kay (The Lions of Al-Rassan), Juliet Marillier (Wolfskin, the original Sevenwaters Trilogy), Mercedes Lackey (the Elemental Masters and the Five Hundred Kingdoms series), Barbara Hambly (The Ladies of Mandrigyn, The Witches of Wenshar), Sharon Shinn (the Twelve Houses series), Brandon Sanderson (Elantris, The Way of Kings, Words of Radiance), and Terry Pratchett (almost any of the Discworld books, especially those featuring the Night’s Watch). Not to neglect science fiction, I’ve recently loved McCaffrey’s The Harper Hall of Pern, Vinge’s The Snow Queen, Thomson’s The Color of Distance, and Czerneda’s Beholder’s Eye. Nearly all of these stories feature intelligent, competent heroines doing cool things — which is the thing I like best to write about. Here’s to all those wonderful books yet unread, and those yet unwritten. I’ve been writing for a very long time, but my first big opportunities to make my work known came through the Atlanta Radio Theatre Company. I’ve been performing with and writing for them since 2004, under the name Kelley Swilley and later Kelley S. Ceccato. That summer, ARTC performed the first script I wrote for them, The House Across the Way, at the Tomato Festival in Stone Mountain Park. The script was later revived and performed at DragonCon in 2010. Since 2004, ARTC has produced and performed seventeen of my scripts. Some of my personal favorites include Nothing-at-All (an embryonic version of my novel Atterwald), Candle Magic (a steampunk retelling of “The Little Match Girl,” soon to be performed at CONjuration in Atlanta this October), The Horseman of the Hollow (a re-imagining of “The Legend of Sleepy Hollow,” performed as part of the “Sleepy Hollow Ride Across America” in October 2011), Sarabande for a Condemned Man (a steampunk retelling of “The Tsaritsa Harpist,” performed at DragonCon in 2011), In Need of a Bard (a fantasy comedy performed at DragonCon in 2013), and Christmas Rose, a short piece that has become a part of ARTC’s holiday canon. Let me tell you about Me — Nan Monroe. Nan Monroe was born Kelley Swilley in 1969, and is now Kelley Swilley Ceccato. “Nan” is my mother’s name; “Monroe” is my father’s name; together they comprise my writing identity. As Kelley S. Ceccato I have written a number of audio dramas for the Atlanta Radio Theatre Company. “The Challenges of Brave Ragnar (stand-alone version),” “The House Across the Way,” “Sarabande for a Condemned Man,” “The Wood-Bound Werewolf,” and “In Need of a Bard” have all been performed at DragonCon. I am a lover of books, movies, and music. I have a passion for Story, and anything that tells a good story, from a novel to a song to a painting, will interest me. I call these things “food for the imagination,” and for as long as I can remember, my goal has been to add my own recipe to the mix. Look for more exciting news in the days ahead. Thanks for reading!